On bid day, college students join Greek organizations that will become their home away from home. This day can be exciting, stressful and filled with fun all at the same time! Use these themes and planning ideas to make bid day a breeze and welcome new sorority members with open arms. Olympics - Celebrate bringing home the gold as your sorority lights a new torch with the newest pledge class. You can even plan simple games like a bean bag toss, a three-legged race or a ring toss throughout the event to make it seem like the real Olympics! Jungle - Welcome new members to the wild side when they step into a jungle-themed bid day filled with animal prints and leaves. Make sure to show your sorority pride because after all, it’s hard to be humble when you’re queen of the jungle! Greatest Show on Earth - Create a circus-themed bid day with gumballs and popcorn to show that the new members joined the Greatest Sorority on Earth. To take it up a notch, explore hiring a petting zoo to give a real circus atmosphere. Candyland - Bring home the sweetest pledge class to a land filled with candy! Construct a rainbow path across the floor and put lollipops in every corner to build a world of sweets. Rock ‘n’ Roll - You can’t always get what you want, but you did with the newest pledge class! Whether you take inspiration from The Rolling Stones, Aerosmith, Queen or AC/DC, you can use temporary tattoos and blow-up guitars to make your bid day rockin’. New Bids on the Block - Stop, collaborate and listen, your sorority is back with some brand-new additions! Make sure you use plenty of neon colors and have boom boxes at the ready to give your theme the ‘90s throwback vibe. Pop-Art - Pow! Bam! Zap! This bid day theme will look like it came straight out of a comic book with pop art designs. Use bold, primary colors to create Andy Warhol’s ideal version of bid day. Friends - Transform your bid day location into the world of Friends (or should we say sisters?). Offer coffee, deli sandwiches and smoothies just like Central Perk! Under the Sea - Show new members that you were “mer-made” for each other and decorate the venue like an underwater world. Add blue tablecloths and Swedish fish to the tables and put green streamers everywhere to look like seaweed! Great Gatsby - Throw a roaring ‘20s bid day bash loaded with sequins, boas and pearls to party like Gatsby. Add a fun touch with lemonade in martini glasses to contribute to the flapper feel. After all, a little party never killed nobody! Gold Rush - You’ve struck gold with your newest pledge class! Dress up with glitter and flash tattoos to make it look like you really have found a gold mine. You can even scatter yummy treats like Rolos and chocolate coins to look like gold nuggets. Top Gun - New members can fly with the best when they join your sorority. Base this theme off the 1986 movie Top Gun, where elite pilots train to become the best. New members will always have plenty of great wing girls! Space Jam - Bid day will be a slam dunk with this theme as members dress up as Michael Jordan and his toon squad. Decorate the location with sports- and space-themed items like planets, stars and basketballs. Wizard of Oz - There’s no place like home at your sorority. New members will click their heels and find their forever home before they know it. Include a yellow brick road and Emerald City to really make it feel like the land of Oz. Beware of the flying monkeys! Alice in Wonderland - Give the newest pledge class a lifetime of adventures by welcoming them into Wonderland. Decorate your site with cards and tea cups to create the world that houses the Mad Hatter and the Queen of Hearts. Survivor - The bid has spoken, and you will now be adding a new pledge class to your tribe! Based on the CBS television series Survivor, tiki torches and bamboo ornaments will truly make it feel like you’ve been sent to a tropical island to outwit, outplay and outlast. Good thing everybody is here to stay! Out of This World - Your new members are out of this world, so why not welcome them to your galaxy with a theme that is equally awesome? Metallic colors and galaxy patterns are your go-to for creating a fun, space-themed bid day. NFL - You’re sure to win the Super Bowl after drafting the finest new members on bid day! Channel this classic American sport by having hot dogs and hamburgers along with sports drinks to fuel your athletes. Hawaiian - Aloha, new members! Take your newest pledge class to Hawaii by creating the perfect luau complete with leis and hibiscus flowers. Serve Hawaiian punch and lots of fruit to make it feel like island time. Barbie World - Welcome new pledge class members to their dream home. Barbie’s favorite color is pink, so that means pink decorations, pink food and even pink drinks. Try making a life-sized Barbie box to take pictures in! Just Do It - Embrace the Nike slogan to kick start the new member’s introduction into sorority life. Set up arcade games like foosball and arcade basketball to have some fun! Mount Olympus - If you’re going to go Greek, it might as well be as a goddess! Host a party fit for the gods with columns and ivy garland decorating your venue. You can also wear laurel wreaths and togas to walk around in Greek style. Willy Wonka’s Chocolate Factory - The newest pledge class has found a golden ticket! Create a sugary wonderland filled with items like chocolate fountains, gobstoppers and fizzy lifting drinks to emulate the world of Willy Wonka. Home Run - New members have made it to the big leagues, so now it’s time to throw a party to celebrate! Knock food out of the park by serving hot dogs and ice cream served in mini plastic baseball hats like a true American ballpark. Color Run - Everyone will have a blast as new members are introduced to their sorority, so why not throw in some color? Make the color run your own and celebrate by throwing colored powder into the air after new members run to the happiest house on bid day. Fight Night - Show the newest pledge class how excited you are to have them by throwing a knockout event for bid day. Ask active members to wear boxing robes and gloves to bring out the fight night feel. Don’t worry, nobody will need to throw in the towel because they will be too busy having fun! Beatles - All you need is love — and some flower power to welcome new members. Tie dye anything and everything and find an old-school Volkswagen bus to embrace the hippie theme. Bring out the flower headbands and round sunglasses to fit in with the times! USA - Uncle Sam has found the best to join your sorority! Stick to an original red, white and blue color palette and decorate with American flags, lady liberty and fireworks to capture the American spirit in your celebration. NASCAR - Just as Ricky Bobby said in Talladega Nights, if you ain’t first, you’re last. Good thing that with this NASCAR-themed bid day, your sorority will come in first with an amazing new pledge class! Create a racetrack along the floor of your venue and accessorize with checkered flags and toy cars. Toy Story - To infinity and beyond! Buzz would be proud — you’ve got a friend in all your new members! Place toys like Mr. Potato Head, Woody, Buzz, Rex and Hamm around the room and use cow prints and cloud patterns to decorate. 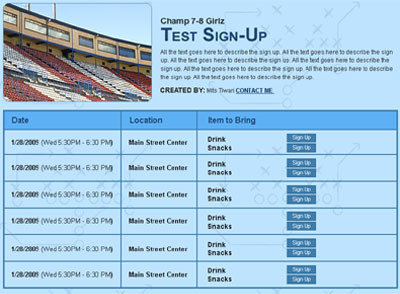 Start Early - If there is any event that might be hindered by procrastination, it’s bid day. Begin planning the moment you learn the date and delegate responsibilities to your bid day committee to plan a memorable event. Set Your Budget - Make sure to calculate your budget before you start planning. Account for items like venue, number of members, food and entertainment to make sure that you have enough money for what you are planning. If you need help, reach out to the previous bid day chair for some advice! Choose a Theme - This is one of the most important steps for a successful bid day. Select a theme that suits the members of your sorority and that you can have fun planning! Design Shirts - Coordinate a look for active members so your sorority has a unique style that stands out from others on bid day. Order Materials - Order anything you might need like T-shirts, fanny packs, balloons, decorations, tablecloths, plates, utensils and glitter to be fully prepared to manage all aspects of bid day. Make Name Signs - Make name signs for new members so they can find you during the chaos after opening bid cards. These can go with your theme, so be creative! Keep in mind that new members might have a hard time seeing over everybody to find their name, so try adding wooden craft sticks to hold them higher in the air. Plan Door Décor - If needed, create a decoration for new members’ dorm room doors to add to the bid day festivities. Book Transportation - Whether it is from the bid announcement site back to the sorority house or to an alternate location, ensure nobody gets lost on the way by scheduling transportation. Assemble New Member Tote Bags - Order small bags and fill them with gifts like decals, stickers, magnets and water bottles to supply new members with some sorority gear. Order Decorations - Get plenty of streamers, balloons and any other decorations for the house or venue that fit in with your theme to add to the atmosphere. Make Banners - Paint signs, posters and banners for the bid announcement and your party room to create a great backdrop for pictures. If you have any artistically gifted members, this is their chance to showcase what they’ve got! Schedule Photography - Reserve a photographer and set up a photo booth at the venue to capture memories on the happy day. New members and active members alike will be able to look back and remember all the fun they had on bid day. Book Entertainment - Arrange for music, a serenade or a DJ for your party to kick off the fun on the dance floor and see who has some moves! Book the Venue - If you have an alternate destination for the celebration or for activities like roller skating or bowling, you will need to make a reservation large enough for your group on bid day. Deep Clean - Make sure the house is spotless before the new members arrive and stock up on supplies such as toilet paper, Kleenex and feminine supplies. Set a Timeline - Schedule everything in your timeline into 30-minute increments to make sure everything runs flawlessly throughout the event. You’ll thank us later! 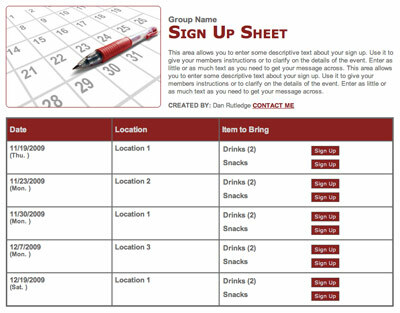 Organize Volunteers - Assign duties to active members to help with the set up and take down of the event. Genius Tip: Create a sign up so members can pick responsibilities. Set the Tone with Social Media - Instruct active members to follow the new members on social media and welcome them to start their experience off right. Make Time to Brag - Encourage active and new members to share bid day posts on social media to show off your hard work! Follow Up - Take time to check up on the new members to make sure that they are adjusting well. While they might have seemed happy on bid day, the magnitude of joining a sorority might not hit them until later. Offering advice and guidance can make a difference! After using these themes and ideas, your sorority’s bid day is sure to be filled with unforgettable experiences and lifelong friends. 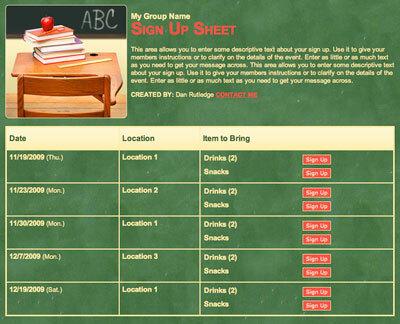 Schedule a study group with a sign up!